(Photo: Ecumenical News / Peter Kenny)From left: World Council of Churches general secretary, Rev. 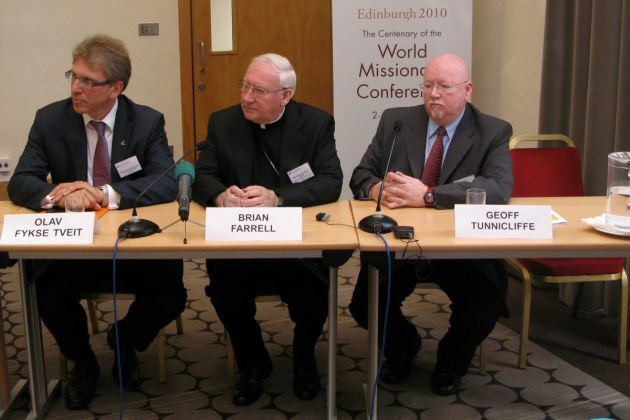 Olav Fykse Tveit, Bishop Brian Farrell, secretary of the Roman Catholic Pontifical Council for Promoting Christian Unity at the World Missionary Conference and Geoff Tunnicliffe, secretary general of the World Evangelical Alliance, in Edinburgh on June 5, 2010. The World Evangelical Alliance has invited churches and Christians around the world to observe the International Day of Prayer for the Persecuted Church on Sunday, November 2 or 9. "Today's greatest untold story is that more than 100 million Christians worldwide face persecution for their faith in the Lord Jesus Christ," says Rev. Godfrey Yogarajah, executive director of the WEA Religious Liberty Commission. "Daily Christians in Eritrea, Nigeria, India, Pakistan, Sudan, Sri Lanka (and many others) face imprisonment, violence and even death," he said in a WEA statement released October 28. Recent reports indicate Christians in Iraq are being forced out or face total extermination at the hands of Islamist extremists. "We are calling on Christians everywhere to stand by these persecuted brothers and sisters in Christ by praying for them and assisting them in any way possible, as commanded in Scripture," he continued. Churches worldwide have set aside the first two Sundays of November to particularly remember and pray for the persecuted Church, through the day of prayer. Christians are called to follow the commands of in the Bible's Book of Hebrews 13:3 to "remember those in prison as if you were their fellow prisoners and those who are mistreated as if you yourselves were suffering." The WEA Religious Liberty Commission has prepared a website with resources for pastors and Christian leaders to use in worship services or small groups. "This year's theme 'Don't Stand in Silence' reminds us of the plight of our brothers and sisters in Christ who suffer persecution, simply because they confess Jesus Christ as Lord," says Dr. Geoff Tunnicliffe, secretary general of the WEA. "Let us unite in prayer for the persecuted Church, in the spirit of oneness that Christ commanded: 'For, if one part suffers, every part suffers' (1 Corinthians 12:26)." (Image: WEA)Logo for the International Day of Prayer for the Persecuted 2014: Don't Stand in Silence. Over two billion Christians in the world today are represented by three world church bodies: the Roman Catholic Church, the World Council of Churches and the World Evangelical Alliance. WEA says it is serving and representing more than 600 million evangelicals. Launched in 1846 to unite evangelicals worldwide, the WEA has seven regional and 129 national Evangelical Alliances, and over 150 member organizations.